General Motors CEO Rick Wagoner will step down from his position immediately as recently reported by various news associations. This comes about maybe as a slight surprise on the eve of President Barack Obama’s expected announcement of a deadline for Chrysler and General Motors to finalize their terms for restructuring or deciding on a Chapter 11 bankruptcy package. As the economy shows no apparent signs of improvement except for the recent stock market rallies the auto industry continues to suffer and look for some type of outlet. 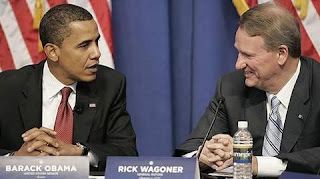 The outlet for Rick Wagoner was specifically requested by the Obama administration. Rick Wagoner spent 32 years with GM and in part over-seeing the operations of General Motors all through its better days and recent slump. Below after the jump is the official message from Rick Wagoner and GM’s board restructuring announcement.